The electioneering in the city has gained momentum with loudspeakers becoming more audible than they have been in this campaign so far. Intensifying their efforts, all candidates have now resorted to personalised contact programme giving door-to-door contact and padyatras the same importance as to ‘nukad’ rallies. Relatives of the candidates from city and far-off places have joined the campaign to boot the prospects of their kin. Like all others, the Shiromani Akali Dal (SAD)-BJP common candidate, Mr Sharanjit Singh Dhillon, has announced that he will further intensify his campaign. Locked in a triangular contest with the Congress nominee, Mr Manish Tiwari and the Lok Bhalai Party President, Mr Balwant Singh Ramoowalia, Mr Dhillon has decided to campaign in the rural areas during the day and in the city during the night. He covers one Vidhan Sabha segment each day. The campaigning comes to an end at 10 pm by which time all candidates have to wind up their canvassing. During the past 24 hours, Mr Dhillon has visited Aggar Nagar, where Mr Darshan Singh Shivalk and Mr Hira Singh Gabria had organised a well-attended election rally. 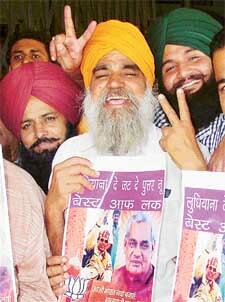 The second rally was held by him near Samrala Chowk, where Mr Pal Singh Grewal mobilised support for him. The third meeting was held at Moti Nagar on the Sherpur road. Mr Dhillon while speaking at these meetings mainly targetted the Congress for what he said was “misrule”. He appealed to the voters to vote and support for him so that the NDA could form the next government at the Centre. He claims that Congress supporters, namely Nachhatar Kaur, Mohinder Singh Chakkiwala, Surjit Singh, Hardev Singh and Hardip Singh, Malkit Singh, Harjinder Singh, Kulwinder Singh, Puran Singh, Jasvir Singh, Sahib Singh and Tarlochan Singh, Sarpanch of Jhar Sahib, village Ranjit Singh, former Sarpanch, Kulwinder Singh of Mushkabad village, Avtar Singh of Harion Khurd have extended support to him after quitting the Congress. Mr Ramoowalia, meanwhile, claims that the second and third rung leaders from the Congress, SAD and BJP are extending support to him as he is the only alternative to the misrule of the traditional political parties. He has appealed to the voters not to get misled by the false claims of the Congress or Akali Dal candidates saying that they have already seen the working of these political parties and the voters must give him a chance. The Congress on the other hand has started its mass-contact programme by going from house to house on foot in highly populated areas and consolidating its votes. Mr Surinder Dawar, MLA from Ludhiana East went on a padayatra in the Kidwai Nagar and Focal Point areas of the city along with Mr Tiwari. Mr Dawar said the Congress nominee would improve the Congress votes polled this time as compared to the previous election. Going into overdrive, the Congress candidate for the Ludhiana Lok Sabha seat addressed around 20 election meetings and rallies in different parts of the city today, seeking support of the electorate to rid the country of the NDA coalition and re-install a Congress government at the Centre. Mr Tiwari addressed rallies at Bharti Colony on the Bahadurke road, Kwality Chowk on the Chimney road, Dholewal, Sherpur, Kanganwal road, Giaspura, Dhandari, Bhai Randhir Singh Nagar, Dashmesh Nagar, Chander Nagar, Udham Singh Nagar, Meharban, Shakti Vihar, Dugri road, Kot Mangal Singh, Dara Colony and Barota road in New Simlapuri. Addressing the meetings, he reiterated his commitment to work for the welfare of the industry, trade and various sections of society. He said he would focus on creating a conducive environment for investment so that big industry was attracted towards the industrial hub of Punjab. With the setting up of more industrial units, the problem of unemployment among the youth could be effectively tackled, he said. Youth Congress activists, led by Mr Sarbjit Singh Bunty and Mr Charanjit Channy, organised a scooter and car rally here today in support of the Congress nominee. The rally, commencing from Old Courts Chowk, passed through many commercial areas before concluding at Clock Tower Chowk. Speaking on the occasion, YC leaders charged the BJP, with fanning communalism in pursuance of its hidden agenda. The government at the Centre had failed to keep the prices of essential commodities under check and the life of common man had become miserable under the NDA rule, he said. Elsewhere, YC activists, led by former vice-president of the district unit Goldy Sabharwal, launched a mass contact programme in the Field Ganj area to mobilise the electorate in favour of the party candidate, Mr Manish Tiwari. The party workers went door to door and distributed pamphlets carrying policies and programmes of the party. According to Mr Sabharwal, the campaign would be extended to other city localities in the coming days. The Captain Brigade, which met at the residence of Mr Bharat Bhushan Thapar on the Bindraban road here, decided to hold corner meetings to step up the Congress election campaign. An election office of the Congress candidate was opened at the residence of Ms Amrit Varsha Rampal, councillor (Ward No 41) in Sarabha Nagar by the Minister for Higher Education, Mr Harnam Dass Johar. The City Mayor, Mr Nahar Singh Gill, was also present at the occasion. Both Mr Johar and Mr Gill called upon the people to cast their vote in favour of Mr Tiwari. Meanwhile, a former Deputy Speaker of the Punjab Assembly and state president of the Trade and Industry Cell of the BJP, Mr Sat Pal Gosain, has embarked upon a daily ‘pad yatra’ in the Ludhiana east assembly segment to garner support for the SAD-BJP candidate, Mr Sharanjit Singh Dhillon. Mr Gosain said he intended to cover each and every street in the area and to visit each household to ensure victory of Mr Dhillon. During the day, the BJP leader went round many colonies, starting from Haathi Mandir in Islamganj to Indira Colony. The Chartered Accountants’ Cell of the BJP, which met at the residence of its president, Mr P.C. Goyal, unanimously decided to extend support to Mr Sharanjit Singh Dhillon. Speaking on the occasion, Mr Anup Kumar Jain said the nation had achieved tremendous progress in the fields of telecommunications, automobiles, banking, insurance and basic infrastructure during the tenure of the NDA government. In order to enable the NDA government to carry on the good work, the BJP and its allies ought to be given another term, he added. In another development, the Akhil Bharatiya Hindu Suraksha Samiti took out a protest march against the BJP, charging it with the betrayal of Hindus on the issue of Ram Temple in Ayodhya. Terming the Prime Minister, Mr Atal Bihari Vajpayee, as a traitor, the protesters called upon the masses to vote against the BJP in the Lok Sabha elections. Mr Rajiv Tandon, Mr Dharmendra Khera and Mr Om Parkash Saini, activists of the samiti, among others, were present on the occasion. A group of people from Ludhiana today left for Bikaner in support of filmstar Dharmendra who is contesting the parliamentary elections from there on the BJP ticket. 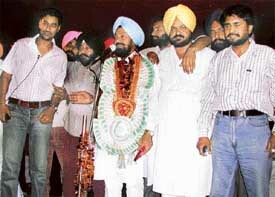 Led by Mr Ram Singh of Lalton village, the 13-member group includes his son Randhir Singh and others of the village. Dhamendra’s family lived in Mr Ram Singh’s house for about six years, when his father Mr Kewal Kishen, was posted as a headmaster in the local school in 1960s. Ram Singh can still recall the modest and respectful Dharmendra, who was always unassuming and down to earth. Moreover, his father lived a spartan life and imbibed a sense of duty and discipline among his children. Ram Singh may have forgotten Dharmendra. But only in the last winter Dharmendra walked into his house late in the night. Ram Singh could not believe his eyes that the superstar was in front of him in flesh and blood. “He was the same true self he used to be in his childhood days...always smiling”, recalls Ram Singh. He stayed with Ram Singh’s family for some time on that night. Today Ram Singh and his son Randhir Singh feel that they should acknowledge the love and respect Dharmendra showed when he visited them, may be after 40 years. “Who could believe that such a big man as he is today would walk into our modest house”, Randhir Singh remarks while claiming that Dharmendra will not necessarily need their support as he will win comfortably. “But we want to take with us the good wishes people have sent for him”, he said. The tour of the group to Bikaner was organised by the local district leaders including the district BJP president, Dr Subash Verma, and another senior leader, Mr Ashok Loomba. “We want to convey to the people of Bikaner that how much he (Dharmendra) is loved by his people even when he left this place over four decades ago”, Mr Loomba said, adding that these people will also help in clarifying certain misgivings and misunderstandings created by some people against him in Bikaner. These people will stay in Bikaner till the completion of the election process and will return only after “Dharmendra wins the Bikaner seat”. Moreover, their trip is also aimed at clarifying the doubts created among people by the Congress that Dharmendra did not belong to the Jat community, as the constituency (Bikaner) has a predominantly Jat population. The Sehajdhari Sikh Federation, a registered political party with the Election Commission, has extended its nationwide unconditional support to the Congress and announced that it will stand by the party nominee Manish Tewari in Ludhiana. Dr P.S. Ranu, national president of the party, after visiting various villages in the constituency, said that in the interest of minorities, the decision had been taken. Dr Ranu said political interference of the Sang Parivar and the Akalis in Sikh religion had created an unnecessary demarcation of Amritdharis and Sehajdharis to weaken the religion. The Congress party had always protected the rights of the minorities, he added. After the exposure of the actions of the RSS in Gujarat by the Supreme Court, there is no scope for justification by the BJP, he said. Criticising the Akali leadership, Dr Ranu said the Akalis were forcibly trying to divide the community. He termed Mr Advani’s “rath yatra” as a portrait of communalism and expressed grief over the saree distribution incident in Lucknow. He claimed that more than 80 per cent of the total world Sikh population is of non-Amritdharis, and all of them in the states of Maharashtra, Bihar, Andhra Pradesh and Delhi are dedicated followers of Guru Granth Sahib. Giving example of Sindhi Sikhs, he added that they have kept alive the Sikh Maryada and respect for Guru Granth Sahib even while living in Pakistan. It is worth mentioning here that the BJP government, under the pressure of the Shiromani Committee and the Akali Dal Badal is not ready to recognise the Sikhs with unshorn hair for which the Sehajdhari Sikh Federation is contesting in the courts of law. The district police has directed Airtel company to stop issuing mobile phone connections without taking the proper identity and addresses of persons as the police was unable to trace the callers who were using their mobile phones in criminal activities. “It is illegal to issue a mobile phone connection without the user’s address and its verification. The police is contemplating taking legal action against the company and its dealers for doing so.” says a letter written to the General Manager Airtel here by the Division No 5 SHO, Anil Joshi. The letter has been written on the complaint of a resident of New Delhi, who had a frustrating experience of searching an Airtel subscriber, suspected to be involved in a criminal case. The complainant Mukesh Kandwal of Khajuri New Delhi had been searching the phone subscriber who was allegedly involved in the abduction of a minor girl of one of his relatives living in Ghaziabad in Uttar Pradesh. In his complaint Mr Mukesh Kandwal claimed that he had other relatives had come here for the search of a girl, who was missing from Ramprastha, Ghaziabad. They were also searching for an Airtel prepaid no. 98720-84176. , which was used by a person who was with her. They first went to Bharti Mobile Ltd. E-25, Industrial Area Phase -2, Mohali, from where we get the details of the incoming or outgoing calls of the above mentioned connection. They learnt that the phone was sold by a dealer operating from a shop in Ishawar Telecom near Preet Cinema, Ludhiana. They hoped that they would find the address and identity of the subscriber but were shocked to know that the dealers were not taking any photographs and residence proof for issuing the prepaid connections. The dealer even asked them they could also buy any prepaid connection of any company from Ludhiana without any documents. They rued that due to the negligence of the dealer and the company, they were not able to identify the culprit. The Punjab Dry Cleaners and Dyers Association has charged around 12 designated branches of Punjab National Bank with causing harassment to their members by not accepting challans of service tax payment under the Central Excise rules. A delegation of the association, led by its president, Mr Santokh Singh Ahluwalia, which met the Deputy Commissioner of Service Tax Cell of the Central Excise here on Saturday, alleged that in the face of refusal of the designated bank branches to accept the payment of the service tax from the dry cleaners and dyers, the assessees were made to suffer for no fault of theirs. Members of the association further impressed upon the Department of Central Excise to educate the tax payers about the filing of tax returns and to further simplify the procedural wrangles because most of the persons in this trade were not highly educated and a majority of small units could not afford to retain trained professionals for maintaining accounts and filing of returns.